Briar, The Wounded King, Threadspinner, and an assortment of other names and titles. Briar is average human height. They are not particularly warm or cold to the touch. Their skin is soft and hairless and has a slightly rubbery quality to it. They have a single eye and their mouth is only visible when in use, otherwise it disappears completely and leaves a totally smooth surface behind. The mouth is not used for speaking. The mouth has lots of sharp teeth inside. They also have a pair of smooth, long black horns. They have talon-like feet and black nails. They have a patch of soft, white hair on their head which is typically just swept to the side. Their most striking feature is the clothing-like flap of skin around their upper body, which is bright red inside and has a soft ring of feathery, fluffy white fur. This skin can be worn like a hood and is sometimes used to store items. They also have a permanent wound at the crotch, which always looks red and sore and is sealed with stitches. It doesn't actually hurt. Briar doesn't know why it's there. Briar is quiet, slow, ponderous, and thoughtful. Despite their looks, Briar is nothing but a benevolent traveler. Briar is not a living creature and thus does not have emotions and experiences like most animals. Briar can feel shades of happiness, contentment, pleasure, sadness, loss, attachment, curiosity and love, but can not feel many emotions tied to survival such as fear, anger, hate, and the desire for vengeance. Despite this, Briar still feels a lot of empathy towards living things and enjoys watching and learning about the world about them. Occasionally, they will live with humans and make friends but generally they live a solitary nomadic life. Red, sewing, cloth, warmth, fire, and scissors, etc. Briar was not born and cannot die. Briar does not recall the beginning of their existence. They just are. At times, Briar fades- this can happen if the body is destroyed, but sometimes it just happens after long periods of Being. Inevitably, Briar will return and continue on their journey. Briar does not technically have a family, but there is a loose sense of brotherhood among their species. Other Moirae exist, though they are far-spread and don't tend to congregate except for exceptional circumstances. There are three branches of Moirae called Clothians, Lachesians, and Atropians. When Moirae meet, they will greet each other, usually referring to each other as "cousin". Briar exists in a fantasy world based loosely on Medieval Germany, particularly the Black Forest region. Briar lives in a massive section of dense forest, typically travelling along a road known as The Red Path. The Red Path is a road throughout the forest that connects to various villages and is named after the red corn poppies that line it on every side. Briar is very fond of these flowers and enjoys maintaining and following the path. 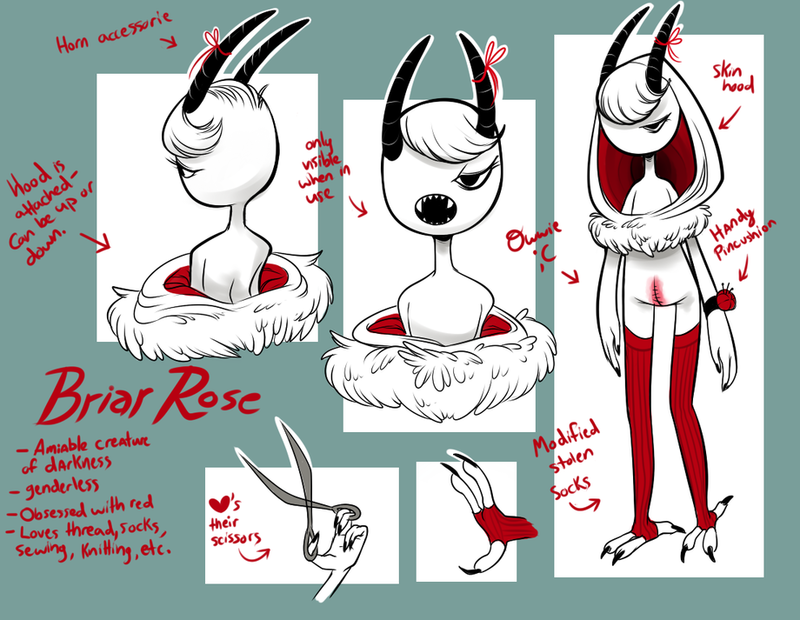 Briar usually only wears a pair of red stockings (modified for taloned feet) and a single red string tied in a bow on one horn. They are not opposed to other clothing though, especially if it's red. A special pair of shears and a pincushion with a strap, as well as various other sewing items like buttons and needles and thread. This is Briar Rose, but really they have a lot of names. They don't really call themselves anything, so they just adopt whatever name someone has given them. This is the mascot of this account, so I guess they can be called King or Crowned or whatever you'd call me. They are agender and will probably go by the pronouns 'they, them'. I slip up too, so if you forget it's fine. It's not even really something most people think about- I imagine most people Briar runs into just assume one way or the other, depending on their own view. Briar is pretty feminine, so I don't doubt many people call her a she, me included. They aren't sure what they are, or how long they've existed- they suppose maybe at some point they were human, but changed somehow. They live alone and wander in dark forests, occasionally making contact with people (usually to trade for goods, like needles, thread, and new socks). They are apparently ageless, and judging by the fact they've survived severe injuries that would have proven lethal to most mortal creatures, difficult to kill. They feel little to no pain when hurt, and heal quickly and without any lasting scars- the only exception to this is their missing eye and the unhealing wound at their crotch. Despite their monstrous appearance, Briar is quiet, soft-spoken, and kind. Though they largely isolate themselves by choice, they do not mind company and can be very jovial at times. They do not need to eat or shield themselves from inclement weather, but they find cooked meat and a warm fire highly enjoyable.